Buy your HOPPECKE Sun | Powerpack Classic 11-48 V battery at the lowest price - online only. The HOPPECKE AGM technology has been optimised to provide a performance equivalent to OPzV. The result: excellent performance which enables for up to 2.500 cycles at a 50% discharge rate. This complete pack is ready for use in an easy way. 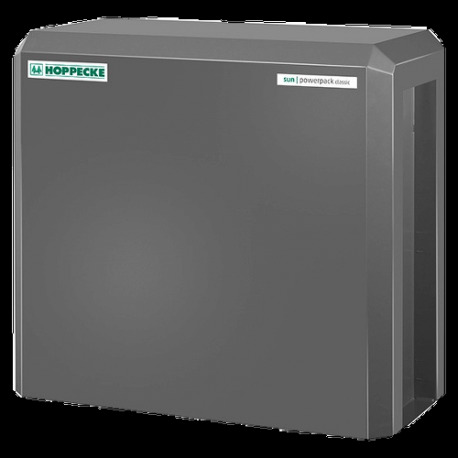 AGM battery: The HOPPECKE Sun Powerpack battery uses AGM technology, the abbreviation of Absorbent Glass Mat. In these batteries, the electrolyte is absorbed by capillarity in a fibreglass matt between the plates. This type of battery offers a better performance than the GEL batteries for high amperage short-term discharge currents (example when starting up). Recycling ensured: HOPPECKE offers a recycling solution for these batteries. The provider guarantees the removal of material arriving at the end of its life and takes care of the recycling of all reyclable raw materials. Made in Germany: HOPPECKE has been developping and producing its products in Germany since 1927. Not only do the batteries have a good reputation, but they also use a particularly reliable and innovative storage technology. Germany as a country stands for quality all around the world. Life cycles: 2.500: With a 50% depth of discharge, the HOPPECKE battery Sun Powerpack has approximately 2 500 life cycles. The optimum temperature for use is 20°C. We estimate the lifespan of this battery to be between 7 to 10 years for a photovoltaic use (considering between 250 and 350 cycles per year). Works at 48 V: The HOPPECKE Sun Powerpack battery functions at 48 V. This battery is easily compatible with the majority of inverters since they have a voltage of 48 V. The advantage of Powerpacks is that they are fitted with all battery safeguards (fusible, circuit breaker,...). Thanks to the PLUG & PLAY system, you only need to plug it in and you are ready to go. Storage capacity: 11.000 Wh: VICTRON batteries offer a capacity of 11.000 Wh to meet your needs. That is equivalent to 11.000 W during 1 hour. If this capacity isn't sufficient, add the same batteries multiple times to your cart. Capacity simply adds up.